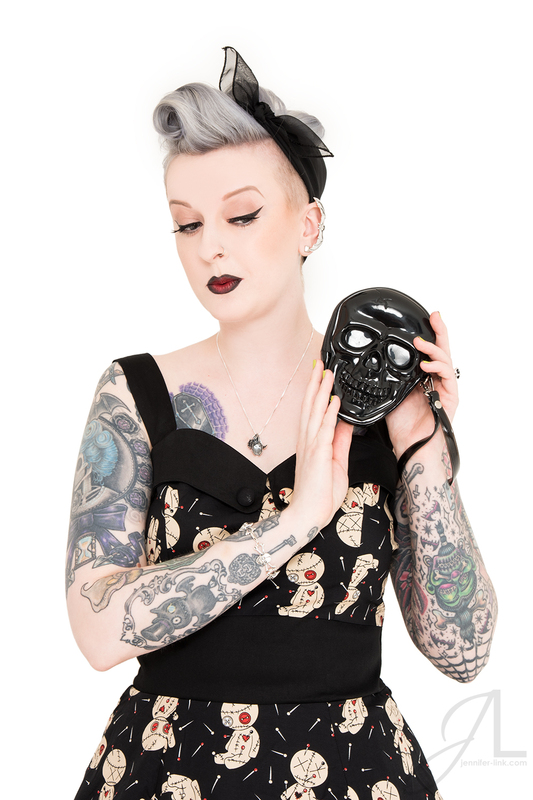 Shannon chose pieces from many alternative fashion designers including Hell Bunny, Voodoo Vixen, Kreepsville 666, Sourpuss Clothing, and Marty Magic Jewelry. Many of the pieces were pulled from Cats Like Us! Bats, spiders, and other spooky creatures gave classic rockabilly pieces like cardigans and swing dresses a fierce feel. To bring the look together we needed some amazing pinup style hair. Lauren Ashley of Atomic Barbershop and Salon was our hairstylist and makeup artist for this shoot. She’s a pro at rockabilly and pinup styles! I have been shooting the Style features for the last few Auxiliary issues so we really have a solid formula and strategy for shooting the feature. We shoot in my studio and focus on getting a full body and upper body shot of each look. The aim of the full body shot is to show off the whole look and the aim of the upper body shot is to show some personality with the look. In between looks Shannon and I style the accessories for product shots to be used in the layout. I have been toying with the idea of featuring more photos from this feature on Auxiliary’s website with some more styling tips, might just have to do that for the next Style feature!